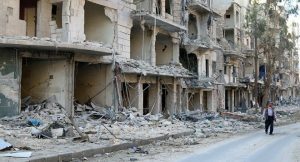 European countries are unlikely to play an independent role in resolving the Syrian crisis and will further follow the stance of the United States, political analyst Nikolai Shlyamin told Radio Sputnik. According to the expert, EU leaders are fully oriented towards the US position. While the US election campaign is still going on, Europeans avoid formulating their opinion on strategic issues, concentrating on details instead, Shlyamin noted. European countries are not expected to take an independent position on the Syrian issue in the foreseeable future, the expert said. “They can’t and, actually, do not want to take any concrete steps. To talk about democracy while sitting in Paris or Berlin is one thing, but to protect the values that they announce in the trenches of Aleppo is another. This is a big difference. None of the Europeans want a Syrian conflict in the form of some sort of armed dispute. It is much simpler to discuss it sitting on a warm couch,” Shlyamin said. On Wednesday, the leaders of Russia, France, Germany and Ukraine gathered in Berlin for the Normandy Four talks. The situation in Syria was one of the main issues of the negotiations. Commenting on Merkel’s statement, Shlyamin noted that “tough” probably means that Russia just defended its position on the Syrian issue. “Tough negotiations? This is when Russia’s position does not coincide with the point of view of the Western Europe,” he said. “Now, when […] it is unclear who will be the future [US] President, did you notice how the European Union has changed its policy? It has become entirely toothless, with the EU making mere statements. All of this has just turned into a common debate, where everyone “pulls the blanket over oneself,” Shlyamin stated.